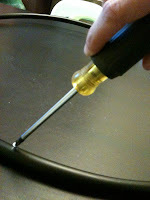 I have spent the last few minutes hemming and hawing about which category to put this post in. Ultimately I decided it should go in the Places to Go category because this has become a destination in our house. I started working on this quiet corner a few months ago after reading a post on Let the Children Play about creating a place for peace. As a teacher I always had a quiet place in my classroom. 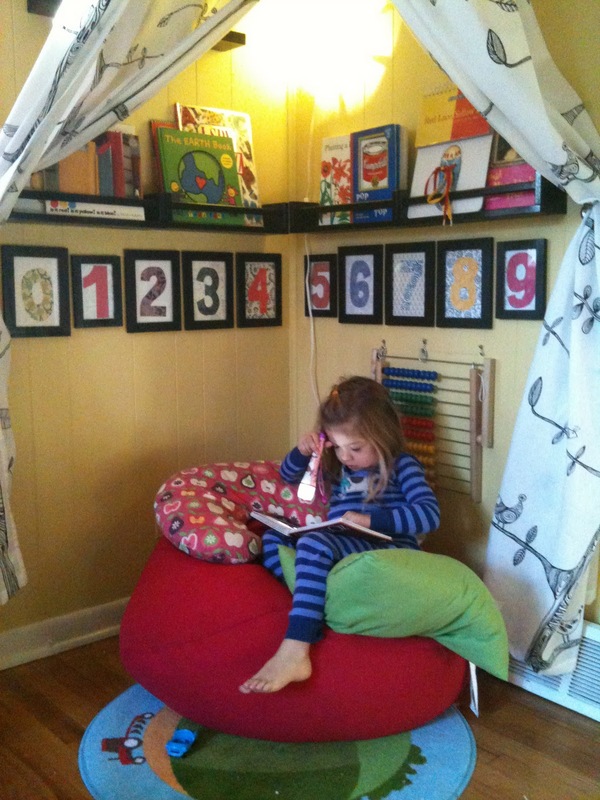 I love the idea of having a area that kids can retreat to when they need to think, rest, or just decompress. However it never occurred to me to have one in my home, but once I started thinking about it I realized that The Bee and The Bean could benefit from a quiet place too! As a toddler and a preschooler they are often dealing with conflict, frustration and over stimulation. So teaching them to take time in a quiet space now to deal with those feelings is a skill they can benefit from now and in the future. To build our quiet space I put all my best DIY skills to the test. 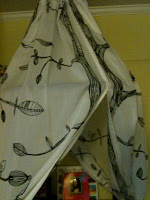 I started the space by creating a canopy that can close to give the space a little more privacy. I begin this venture by hanging a heavy duty hook from the ceiling. Then using landscaping tubing (which we had in our garage but you could get at any hardware/home improvment store) I made a circle and taped the ends together with duct tape. I then screwed four screw into the top of the circle.Next I used a heavy duty string, cut four equal pieces which I tied to the screw then to the hook in the ceiling. Once my hoop was balanced and hanging I took the curtains I found at Ikea and ran a string through the tabs. I tied the string to the hook hanging from the ceiling and repeated the step for the other curtain. When the curtains were securely hanging from the ceiling I then sewed the two curtain together along the top portion so that they would stay over the hoop. To keep the curtains open I put two 3m hooks on the wall to use as curtain tie backs. I wanted to add some things for the girls to do in the quiet space, so I spray painted a few spice racks, also from Ikea, and hung them to hold the books. I originally saw this idea on Pinterest via Ohdeedoh. I then hung an abacus and made the collage numbers for a little decoration. A little floor mat and a few pillows and we had a new quiet space. The girls have already spent a ton of time here. They have used it as a place to play and as a place to read or sit quietly. to easily push the screws in. covers making it easy to find the book you want. quiet activities to do in the space. 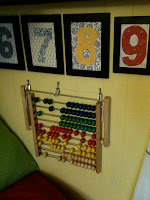 love this idea...a is not quite yet ready for quiet space, although mama can benefit greatly lol. thanks!